While the Robert Trent Jones Trail gets the most attention from golfers traveling to Alabama, the Mobile area down South definitely shouldn’t be overlooked as there are plenty of quality golfing options that will give you bang for your bucks. You can still get a taste of the RTJ Trail with three of the original golf courses at Magnolia Grove—the Crossings and the Falls plus the par-3 Short Course–in Mobile and you can play two of the courses added to the trail at the Lakewood Golf Club—the Dogwood and Azalea. Lakewood was built back in 1947 by Perry Maxwell, the Oklahoma architect best known for designing Southern Hills Country Club in Tulsa. There were two nines aptly named Azalea and Dogwood because of the profusion of each on the property. Today there are 36 holes with the same names where members along with guests of the Grand Hotel and RTJ Trail players alternate days playing. At Magnolia Grove, the Crossings is a parkland type layout with some water features and crushed oyster shell waste areas plus numerous pulpit bunkers and undulating greens that will demand your attention if your approach shots aren’t accurate while the Falls is also carved through hardwood and pines with large greens and massive cloverleaf bunkers that also require accurate approach shots. Both received extensive renovations in the past five years that have made them more player friendly without changing the integrity of the original designs done by Roger Rulewich of the Robert Trent Jones company with an assist from Bobby Vaughan. The greens now feature Mini Verde ultra dwarf Bermuda that make for great putting surfaces even with all the play they get. 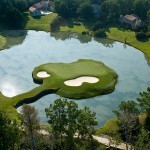 The green fees range from $72.30 to $92.30 on the two courses or $46.15 after 2 p.m. Trail card holders pay $46.15 to $51.30. The Short Course features par 3s, not the normal pitch and putt variety as some are longer than 200 yards, that could be placed on either of the other two courses. It has been called the best in America by Golf Digest and one guest I talked to agreed. Green fees were $31.90 when we visited. 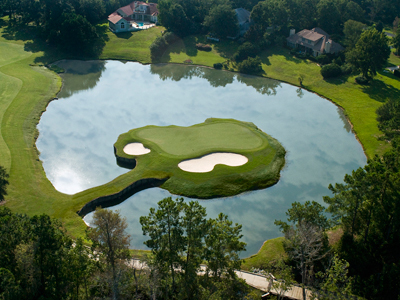 Golfers should also consider a pair of designs by Alabama architect Earl Stone, the 27-hole Timber Creek Golf Club and the 18-hole Rock Creek. 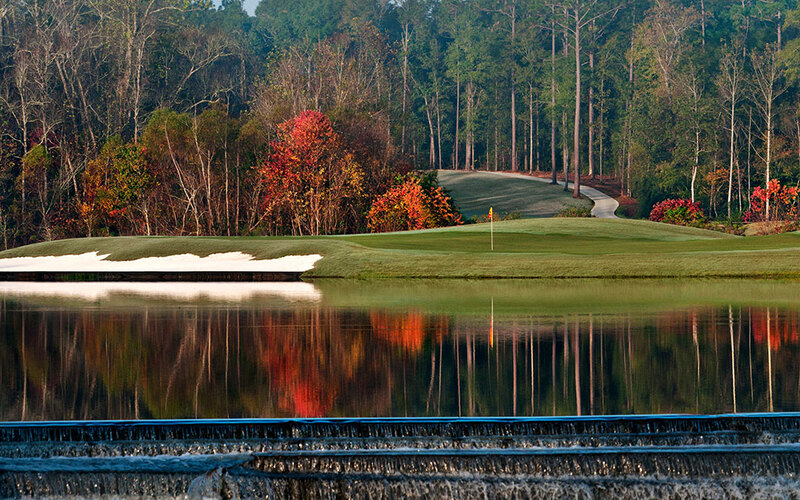 Timbercreek features spacious rolling fairways carved through the wetlands and forest of Dogwood, Magnolia and Pine—giving the nines their names—with lots of elevation changes. It’s a player friendly layout from the forward tees, but can be challenging from the tips for those willing to try 7,000+ yards. Rock Creek, which will be added to Troon’s collection of quality golfing options, meanders through the scenic Rock Creek basin and features some of the highest elevations in this part of Alabama. Along with a group of other writers, I got a first-hand look at all of the these courses on my first trip to Alabama, which I hope is not my last such adventure. We stayed two nights each at the Grand Hotel Marriott, which boasts an historic setting on the eastern shore of Mobilene Bay, and the historic Battle House Renaissance Hotel in downtown Mobile. Both are part of Alabama’s PCH Resorts & Hotels, a sister company to the RTJ Golf Trail, and rank among the best I’ve ever had the opportunity to stay in. Another reason to come back is all the fantastic seafood.